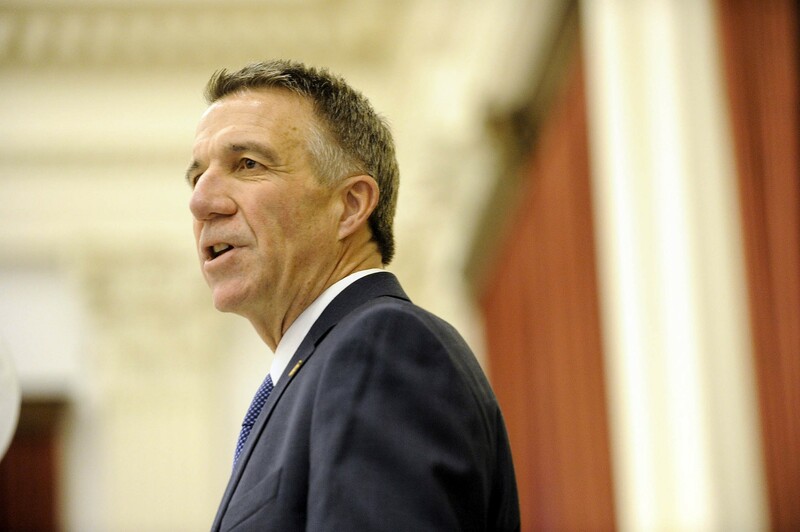 Phil Scott took office as Vermont’s 82nd governor Thursday, promising to revitalize the economy, transform the state’s education system, build sustainable state budgets and fight opiate addiction. “I do so with the understanding of the challenges we face, and those who sent us here to solve them,” he said during the 30-minute address. Scott, a Barre native who co-owned an excavation company and made a name for himself as a race car driver, said he never envisioned becoming governor. He honored his late father, Howard, who lost both legs in World War II and died of his injuries when Scott was 11. The flag that had covered his father’s casket flew Thursday on the Statehouse lawn in commemoration. Scott waves as lawmakers applaud. His address, given with Scott’s mother, wife and daughters listening in the audience along with four former governors, was more ceremonial than substantive. 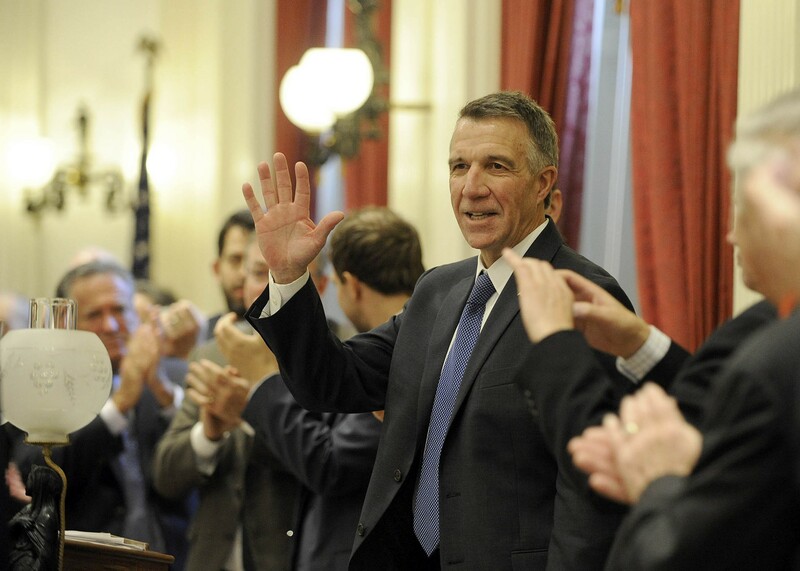 A full chamber of state leaders greeted Scott’s inauguration with a standing ovation. Scott spoke about training Vermonters to fill available jobs and setting specific housing targets for working families and young professionals. He was less specific about how he will transform education. “We must be bold, together,” he said, decrying the $19,000 Vermont spends per student. “We’re not yet an education destination for young families,” he said. Scott said he would challenge school boards, superintendents and teachers to improve the quality of education. But what that means, or how it will transform education, was left unsaid. Scott said that he wanted school boards and superintendents to focus on quality, not budgets. Scott said he created a new government modernization and efficiency team, which, he said, will work to make state government more productive. To meet his pledge to fight opiate addiction, Scott said he would appoint a director of drug abuse prevention and would convene a state convention on the topic. Scott promised to produce a balanced budget in three weeks without raising taxes or fees while still protecting the state’s most vulnerable people, providing access to health care and protecting the environment. He said he would meet the goals to clean up Lake Champlain without relying on new funding. Scott revealed little about how he will meet his goals. That left many legislators and those who follow state issues wondering just what to expect from a Scott administration. “I didn’t hear a blueprint for how you address any of those priorities,” said Senate President Pro Tempore Tim Ashe (D/P-Chittenden), who was newly elected to his post on Wednesday. House Speaker Mitzi Johnson (D-South Hero) said she shares the goal of making government more efficient and modern. But she said, “I would really like to see some of the details.” As for Scott’s school goals, “I have no idea what he’s planning there,” said Johnson, who was elected to her post a day earlier. He also said that inaugural speeches don’t typically get deep into policy. “I thought I was specific about trying to live within our means, trying to find ways to do things more efficiently. I thought I laid it out fairly well,” he said. Johnson further expressed doubts that Scott would be able to pass a balanced budget without any increase in revenue. “I can’t for the life of me picture how you do that without substantial cuts,” she said. She also questioned his resistance to adding funding for lake cleanup. “I’m willing to have the conversation and I’m sorry that he’s not,” Johnson said. Environmental advocates also highlighted lake funding as a concern with the new governor. Scott signed executive orders Thursday afternoon directing state agencies and departments to focus on three goals: strengthening the economy, making Vermont more affordable and protecting the most vulnerable. It was unclear what signing a piece of paper would accomplish, but Scott argued afterward that the orders were intended to keep his staff’s focus on those goals.